London - Usain Bolt took a momentary break from basking in his historic Olympic sprinting double to fiercely criticize Carl Lewis. Soon after winning gold in the 200 meters at the London Olympics for 100 and 200 titles at back-to-back games, Bolt said Thursday he had "lost all respect" for Lewis after the American was quoted as saying Jamaica's doping controls were not as strong as other countries. While not making any direct accusations, former 100 and 200 Olympic champion Lewis has said in recent years that Jamaican drug testing procedures might need to be tightened. The comments brought a stern reaction from Bolt at Olympic Stadium, right after he roared to an unprecedented second 200-meter title at the games. No other athlete has won the 200 twice at the Olympics, although Lewis won the event in 1984 and finished second in the 1988 Games. With the smile that had been a constant fixture throughout his press conference vanishing from his face, Bolt lashed out at nine-time gold-medal winner Lewis after being asked if he'd like to be compared with him or late sprinting great Jesse Owens. "I'm going to say something controversial right now. 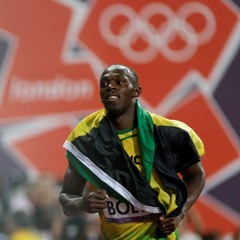 Carl Lewis, I have no respect for him," Bolt said. "The things he says about the track athletes is really downgrading for another athlete to say something like that. I think he's just looking for attention, really, because nobody really talks much about him. "That was really sad for me when I heard the other day what he was saying. It was upsetting. I've lost all respect for him. All respect." Asked which specific comments from Lewis made him angry, Bolt replied: "It was all about drugs. Talking about drugs. For me, an athlete out of the sport to be saying that. That was really upsetting for me. Really upsetting. "To jump up and say something like that. As far as I'm concerned he's looking for attention. That's all." Lewis, the former 100 and 200 Olympic champion, has raised questions in recent years about Jamaican drug testing procedures. Following Bolt's performance in Beijing, Lewis told Sports Illustrated: "Countries like Jamaica do not have a random program, so they can go months without being tested. I'm not saying anyone is on anything, but everyone needs to be on a level playing field." Bolt had already dealt with one question about doping when he was asked Thursday if he could guarantee that Jamaican sprinters — who swept the top three spots in the 200 — were clean. "Without a doubt," Bolt said, sitting in between silver medalist Yohan Blake and bronze winner Warren Weir. "We train really hard."